Our bodies move naturally in time to the tunes that we hear by chance. 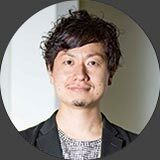 While this is an involuntary response, an advanced level of information processing, which is possible only for human beings, takes place inside our brains at that point in time.Assistant Professor Shinya Fujii is an unconventional researcher. After falling in love with the drums in his teens,he has been polishing his skills as a drummer while engaging in research work based on the themes of drums and music. He is currently conducting research on a wide range of subjects concerning the fundamental question of what music is to human beings, from the perspective of neuroscience and physical science.Music holds a wealth of hints to contribute to our understanding of human beings,and we may find the key to solving the puzzle behind human evolution hidden in its depths. I specialize in music and neuroscience (neuromusic) and physical science, and conduct research about the skillful musical performance, and how music is processed in the human brain. I am a researcher, as well as a drummer. My love for drums led me to start research on the muscles and physical movements of drummers, and I took up an electromyographic study on the world’s fastest drummer (WFD). The WFD can play the drums with both hands at a speed of about 1,200 times per minute. I shed light on how the WFD activates his wrist muscles to achieve transcendental performance. Generally, the performing arts are not expressed in the form of numerical figures, but it would be possible to provide an explanation on the differences between skillful players and less skillful players if we drew up a mathematical model and took quantitative measure of the performance. Furthermore, I measured the brain function and structure of the world’s fastest drummer by using MRI at Beth Israel Deaconess Medical Center and Harvard Medical School, and conducted research on the differences between the brains of drummers and the brains of singers. As I made progress on the research, I began to pursue the more fundamental question of why humans are able to play the drums and perform in rhythm to begin with, and what music is for human beings. Hence, I am now conducting research about the origins of musicality in human beings, and how music and linguistic rhythms are processed in the brain. Fujii developed the Harvard Beat Assessment Test (H-BAT) (left) jointly with Dr. Schlaug at Harvard Medical School. H-BAT can be used to conduct separate assessments on the rhythm perception and production. The figure on the right shows the regions of the brain that are related to the processing of musical and linguistic rhythms. The aim is to elucidate the similarities and differences in the brain’s information processing processes for musical and linguistic rhythms, and to develop a new speech rehabilitation method as well as effective second-language acquisition techniques. I think that the key to unraveling the mystery of the evolution of human beings is hidden in the ability to synchronize body movements to musical rhythms. To us, perceiving musical rhythms and moving our bodies in time to the beat may seem to be a natural and ordinary act. However, animals other than human beings have difficulties in synchronizing to the beat even if they are trained. Moving our heads and clapping to the beat in time with a simple rhythm is in fact a difficult act. The process of perceiving musical rhythms includes a highly advanced and complex information processing process that takes place in the brain. Are there any secrets to how human beings become human, and how we move our bodies in time to musical rhythms? With this question in mind, I also conducted research about when we begin to move our bodies in time to musical rhythms during our developmental process, by having babies listen to music. By exploring the origins of the development of musicality in human beings, it is possible to gain a comprehensive understanding of the origins of human perception, cognition, motion control, memory, emotion, communication, and creativity, through the “window” of music. How does the human brain perceive musical rhythms, and how does it synchronize the movements of the body to match the rhythms that it perceives? By elucidating that mechanism, I believe that it will be possible to obtain hints to the ultimate question of what human beings are. My current research project involves augmentation of human intelligence through cutting-edge technology. For example, I am trying beating the record set by the world’s fastest drummer while using brain-machine interface technologies. The world’s fastest drummer is known as a genius, and his performance may be considered to be a natural gift. On the other hand, as I have shed light on how the muscles work during performance through my previous research work, I think it should be possible to establish an unprecedented learning method if we studied how the brain and muscles work together in a coordinated manner, stimulated the brain and muscles artificially using technology, and fed back the information. By harnessing such cutting-edge brain-machine interface technology and augmenting the learning ability of the human brain, I dream of a future where ordinary people can easily acquire the transcendental skills of a genius. The drum alone holds a universe that facilitates understanding of human beings, and the research theme would expand infinitely if we were to consider “music” as a larger genre. There is much outstanding research in Japan in fields such as neuroscience, physical science, cognitive science, and motor control. When we combine this strength with music, we can anticipate the birth of interesting research that far surpasses the research that has been carried out to date. By expanding human intelligence and creativity through music, I hope to create a movement for disseminating revolutionary research from the Shonan Fujisawa Campus (SFC) to the world. The world’s fastest drummer sets record with over 20 beats per second (1,200 beats per minute). 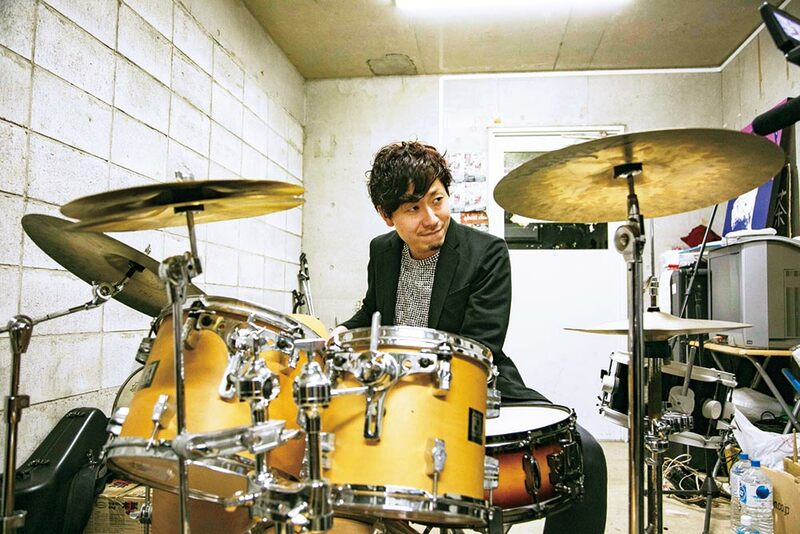 Fujii has unlocked the secrets behind how the world’s fastest drummer moves his wrist muscles to perform with transcendental skills. The data that was actually measured and taken is shown in the diagram. When I was a student in university, I was passionate about practicing on the drums for many hours every day. The motivation which drove me at the time was my desire to produce the sounds I was pursuing. I am now studying “music-supported rehabilitation,” which applies such musical motivation to medical applications. After a stroke patient sustains damage to the motor area of the brain, it is important to go through rehabilitation in order to reacquire his or her original motor skills. In light of that, I took up the initiative of developing an auditory feedback system to help patients reacquire their former movements in an enjoyable manner, through the skillful use of their motivation to listen to the music that they like. If they were able to engage in such exercises, they would be able to listen to comfortable sounds or the music they like. Since such exercises are fed back in the form of sounds, I study how this system can be used to help patients relearn reaching movements. Furthermore, while it is difficult for patients of Parkinson’s disease to exercise, we know that matching the movements to musical rhythms makes it easier for them to do so. However, we have not learnt enough about that mechanism. When a patient sustains damage to his or her brain, resulting in difficulty in physical movements, what are the kinds of changes that arise when they listen to music, and how does this make it easier for them to move? By gaining an understanding of this, we may be able to design an environment that can effectively improve patients’ symptoms by having them listen to music, without relying on surgical operations and medication. There is great potential in the relationship between music, brains, and medicine. We often talk about a “poor or good sense of rhythm.” There are individual differences in the generation of rhythm. This sense of rhythm is broadly related to two capabilities. These are the ability to listen to sounds with the ear, and the ability to move our bodies in response to the sounds we hear. There is a divergence between this sense of rhythm of perception, and sense of rhythm of movement. For example, there are cases where the movements of the fingers are able to adapt to differences in speeds that the ear cannot perceive. 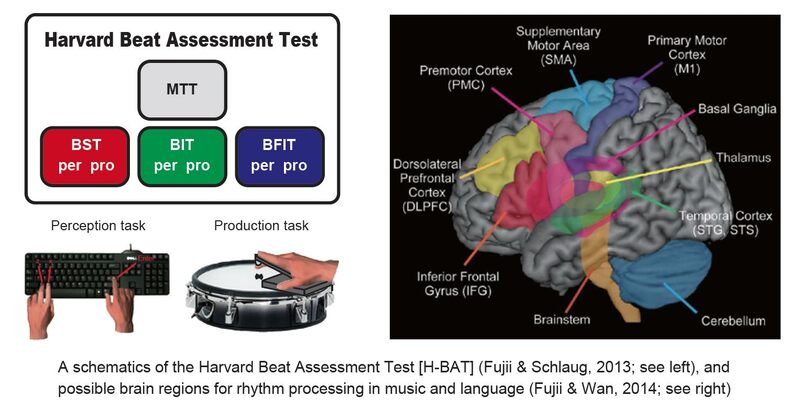 When I was studying at Beth Israel Deaconess Medical Center and Harvard Medical School, I developed the “Harvard Beat Assessment Test (H-BAT)” that is able to assess these two senses of rhythm separately, and conducted research on individual differences in the sense of rhythm. My current research interest lies in the relationship between linguistic rhythm and musical rhythm. In a paper published in 2014, I presented the “SEP hypothesis” as an approach for understanding how the brain processes musical and linguistic rhythms. “SEP” refers to both “Sound Envelope Processing” and “Synchronization and Entrainment to Pulse.” By understanding how the low-frequency components of sound waves are processed in the brain, and elucidating the mechanism in the brain when the body’s movements are synchronized with and drawn into the beat and rhythm of the sound, I propose the possibility of gaining deeper understanding into the relationship between linguistic and musical rhythms. By harnessing this research, I believe it may be possible to develop an effective method for acquiring a second language, as well as new speech rehabilitation methods. When a person sustains damage to the brain’s motor area as the result of stroke, it is important to undergo rehabilitation in order to reacquire his or her original motor skills. To that end, Fujii has developed an auditory feedback system that harnesses the desire to listen to one’s favorite songs and comforting sounds, in order to help patients reacquire their original motor skills in an enjoyable way. By designing an environment that fully utilizes the power of music, he seeks to revolutionize the medical and social scene. Assistant Professor, Faculty of Environment and Information Studies, Keio University.Completed the doctoral program at the Graduate School of Human and Environmental Studies,Kyoto University. Ph.D. in Human and Environmental Studies.